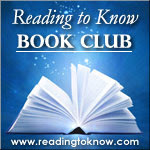 I have to confess that I inwardly groaned when Amy said that she'd wanted to read The Adventures of Tom Sawyer during the month of May for the Reading to Know book club. I had read this book before and recall not liking it, mostly because Tom is so very disobedient. I generally am not amused by disobedient behavior. So I wasn't very eager to spend time with Tom again. In the end though, I am very glad that Amy choose this book because I ended up rather enjoying myself! I still don't like Tom very much, as a character, but I really like Mark Twain's sense of humor. He amuses me. He amuses me very much. Despite my early misgivings, I ended up chuckling through quite a bit of this book and finding The Adventures of Tom Sawyer to be quite diverting! 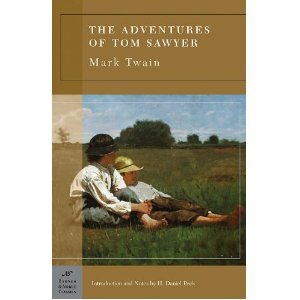 The basic plot of the book, should you be unfamiliar with it, surrounds the boyish romps and mischief making of Tom Sawyer and his friend, Huckleberry Finn. It is a series of stories of the scrapes that Tom gets into, more or less. The chief subject of interest in this book is a murder, which Tom and Huck witness. That sounds rather gruesome and in some ways it most certainly is. However, Twain deals with the subject in the most lighthearted manner possible, while still holding to the idea that the murder is serious, scary business. Tom and Huck's escapades including dodging the murderer while living their normal life, playing hookey from school and Tom climbing out his bedroom window every night to explore the world while his guardian and aunt, Polly, frets and worries about him endlessly. Tom really is a most selfish boy and is horribly disrespectful towards his aunt. Twain brushes this off by explaining that he's a boy and is thoughtless by nature. I'm still unimpressed with him in general. I really did have a good time with Tom so I must apologize to Amy for my initial groanings! Then I must follow that up with a quick Thank You for choosing such a fun and light hearted read. I appreciated it! This also, by the way, proves the point that it's a good idea to read a book more than once. Your first impression, while important, might be better improved upon a deeper knowledge and understanding of the work. Yes, I agree---reading a book more than once (especially after you've reached a certain maturity ;-) ) is a good thing! I had to giggle at some of your thoughts and I somehow knew you wouldn't like Tom because he's not a good boy (like Anne and all the other good little girls of literature, like Amy mentioned). My experience with little boys (three sons, a brother, countless sons of friends) confirms that they frequently are, indeed, thoughtless. So Tom rings true to me. I also seem to recall reading somewhere that Tom is a composite sketch of several boys Twain had known, so I sort of take him that way. All the (yes) selfish, thoughtless escapades several little boys experienced rolled into one likable character. (I thought about typing 'likable' in all caps, giggle) I see it as a dream world for a little boy and all the grand adventures he could have, if only he didn't have to submit to his mama's training. :D It will be interesting to see what your boys think of it as they get older. HA! I forgot to mention in my review that I think I DID enjoy it more because I read the introduction by Twain in which he said that Tom was made up from three different boys that he knew. That was helpful in understanding that no one particular boy could have POSSIBLY fallen into as much trouble as Tom did. I was eased into the book that way. I'm very glad to have re-read it, yes. And I know, Amy. For shame! Initially I struggled with his behavior/attitude, too. I do agree it is good to reread books some times, even books we didn't like at first, because perspective changes. I wish I'd had time to do so with Tom this time, but maybe some day. I'll try to post from the perspective of a former (ahem - who am I kidding?) boy. I must confess I have never read the book either but remember it as a favorite movie from childhood. Your "making" of a fever antics cracked me right up. I will admit that as a child I like Huck Finn better. I don't usually tend to be super conservative when it comes to "naughty" characters--so I was a little surprised when I ended up reacting as strongly as I did to Tom's naughtiness. However, like you, I found myself appreciating Twain's humor amidst Tom's appalling behavior. I once tried to gag myself so I'd throw up and could stay home. It didn't work. :( The gagging part. Just couldn't do it. As the mom of 3 boys, I think Tom is absolutely a believable character. No offense to your lone male commenter, but as a general rule, boys don't think through their actions or how others will be affected. Life with boys is never dull! !